Step it up, Sidney Crosby. The Pittsburgh Penguins can't win this playoff series without you. 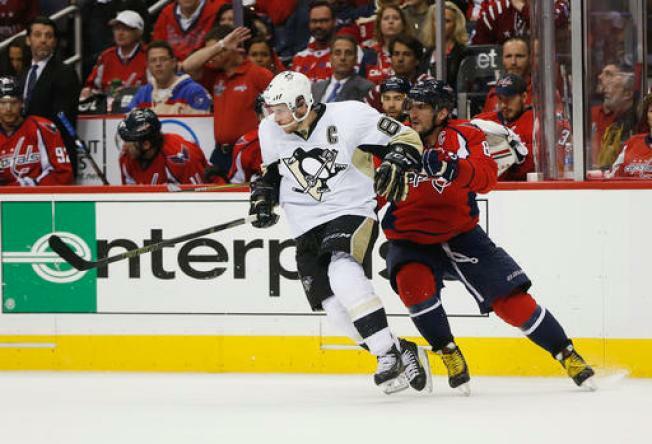 Crosby was ineffective offensively and on the ice for three Washington Capitals goals Thursday night in the Penguins' 4-3 overtime loss in Game 1. His line was shut down by the Capitals' top trio of Alex Ovechkin, Nicklas Backstrom and T.J. Oshie, something that Crosby can't let happen again in Game 2 on Saturday night. "You don't like being on for goals, definitely not," Crosby said Friday. "I don't think we need to change a thing. We need to make sure we're paying attention to the right things and not giving them easy things, but they're a good line and they're going to get chances. We've got to get ours too." Matching fire against fire worked out great for Washington when Oshie racked up a hat trick in the series opener. At the other end of the ice, Backstrom was his usual lockdown defensive self, shadowing Crosby the way Detroit Red Wings captain Henrik Zetterberg used to, with great success. Crosby, the NHL's third-leading scorer in the regular season, is bound to bounce back and adjust offensively alongside linemates Conor Sheary and Patric Hornqvist. The Capitals expect nothing less, but coach Barry Trotz hasn't lowered his expectations for Backstrom and Co.
"Try to outplay them every game," Trotz said. "Sid's a proud (guy). His line was proud. I know Patric Hornqvist very well. They'll respond as true pros." Stopping Crosby isn't a one- or even a three-man job. Former teammate Brooks Orpik said it's up to every Capitals player on the ice to be aware of where Crosby is and limit the room he has to operate. Also, don't forget about him because of one tough game. "Every time people write him off or doubt him, he finds a way to prove people wrong," Orpik said. "Just like this year when he had a slower start and then ... he finished third in the league in scoring. It's one of those guys that you key on, but he always finds ways to make adjustments." Pittsburgh coach Mike Sullivan could try to move Crosby around to get him better matchups. Having a lineup with Evgeni Malkin, Phil Kessel and other offensive weapons helps, though the questionable status of Chris Kunitz after getting hit in the face with a puck on the bench could hurt. With or without Kunitz, the Penguins will continue to count on Crosby to produce offensively. No single matchup scares Crosby. "We think Sid can play against anybody," Sullivan said. "I think he really takes pride in it. We think he's an elite player. He plays at both ends of the rink. He's got a complete game." Crosby needs to show that complete game for the Penguins to even the series.